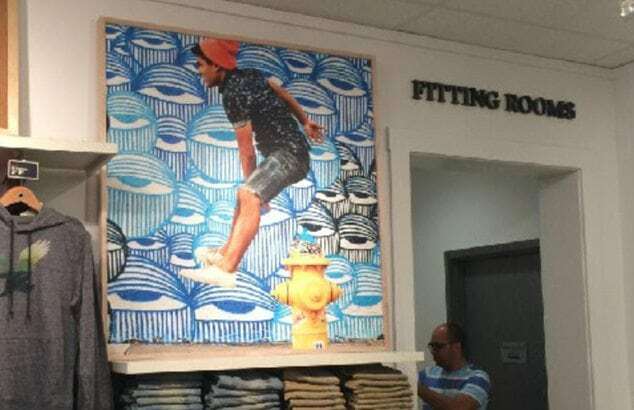 Did American Eagle Rip Off a Miami Street Artist? Graffiti or Street Art has come a long way since the raw style adorning New York Subways or marking gang territories in the 1970’s. Street artists have gained a healthy following of fans enamored by their non-traditional approach to shape and color; an aesthetic highlighting socially relevant themes that appeal to a demographic that shuns the ordered and mundane art of the traditional gallery. In blighted areas, such as Miami’s Wynwood Art District, street art transforms a once bleak, treeless landscape of urban decay, into a hip and trendy neighborhood filled with the hottest restaurants, bars and art galleries. 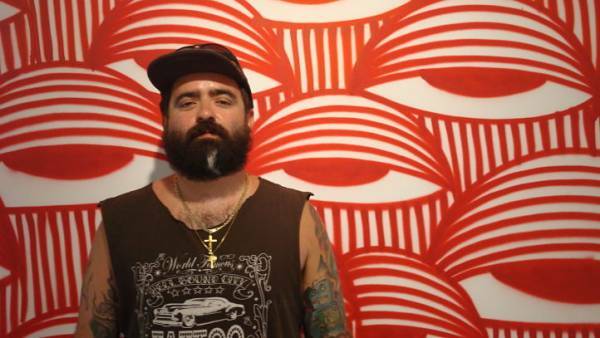 Wynwood is a model of graffiti art featuring grandiose murals by some of Miami’s most prominent artists, including AholSniffsGlue (David Anasagasti), the best street artist of 2014 according to the Miami New Times. Known for his anti-corporate message, Ahol focuses on ‘the veneer of our everyday surroundings and the dull, job-related conflicts often encountered in a dysfunctional workplace.’ So when Ahol discovered that international clothing giant American Eagle Outfitters (AEO) was using his work in its new ad campaign, without his authorization, attribution or compensation, he took action and filed a lawsuit for copyright infringement. It seems a bit odd that a major company like AEO would make such an egregious error. The complaint states that the company had Ansagasti’s personal information yet never made any attempt to reach him. Rather than being an error, maybe AEO believed that getting permission wasn’t necessary? The problem is that the law is not settled on this issue. The uncertainty perhaps has made some companies a little bold. On the one hand, any street art should receive copyright protection. Copyright protection is available for “any original work of authorship that is fixed in any tangible medium of expression.” However, courts and commentators have suggested that illegal work is not subject to copyright protection because a work must be free from illegality. The basis for this requirement is that no one should profit from his or her wrongs. Some would say that street artists are nothing more than vandals intent on defacing private property. Creating works without the property owner’s permission does open up the artist to criminal charges of vandalism or trespass, depending upon the local laws. The risk keeps most street artists from claiming copyright infringement. Even Banksy, one of the most polar street artists today, keeps his identity secret in the pursuit of his art. Banksy’s work is reproduced without fear of being embroiled in a copyright infringement lawsuit. Even sales of his original works hasn’t brought Banksy out into the open. In 2013, “Slave Labour,” a Banksy mural behind a discount shop in London, was sold at a private auction for $1.1 million. His anonymity has served Banksy well, especially given the New York Police desire to “question him in connection with the vandalism. If they catch him, he will be charged with vandalism.” Given the risk, it is not surprising that so few graffiti related copyright infringement cases make it to court. Those few cases that are filed have ended in a settlement, without legal weight. This case then has the potential to write new law, assuming the parties don’t settle this case first. How the case will turn out is hard to say, but one part of the U.S. Copyright Statute that may have some bearing. Although the Statute does not say explicitly that illegal work is un-copyrightable, it does exclude copyright protection for compilations and derivative works that use copyrighted material unlawfully. By leaving out similar language for original works, Congress may have indicated its intent to allow copyright in any creative work that is fixed in a tangible medium; created by illegal means or not. What do you think about street art and copyright protection? Let us know. For more detailed information on this case, the complaint is provided below. *Please note that while some press articles have said that Anasagasti’s works were commissioned, nothing in the complaint indicates such. So this article is written with the belief that Anasagasti had no permission from the property owner when creating his murals. This brings us a question that you haven’t addressed. Street art is deliberately created in public spaces for public viewing. How does that effect copyright? Does that mean photographers have to get permission or a release for every building, sculpture, person that may subject or background in their photographs?